Today we address asymmetrical player powers. In board games, one of the most important elements of any game is the beginning. Do all players start off at the same level (not accounting for player skill of course)? Do they all have equal access to potential victory from the start? While many factors can affect the balance at the start of the game (such as turn order), the biggest is probably the inclusion of asymmetrical powers. That is, instead of everyone starting off on identical ground, each player gets some sort of power or ability or bonus that is unique to them. It is definitely important that these powers be balanced, but I think that these unique player powers are awesome and should be used whenever possible. Now let me tell you Why, why, why! Asymmetry provides direction: It can be tough at the start of a strategy game to choose a direction of strategy to pursue, but having an inherent bonus in one direction will give players a clue. “Well, I’m not sure what to do, but I’m good at military so I guess I’ll build my army,” or “Well I get a bonus when I sell Rum so I guess I’ll try and get my hands on that” is a much better place to be in than “well I’m not sure what to do, ugh, hmm, a little help?” A player with some idea of what to do is going to have a lot more fun than someone struggling to put together any sort of strategy at all. Asymmetry is replayability: Everyone wants their games to be replayable. You want to increase your enjoyment-hours-per-dollar of a game you purchase, obviously, but some games can grow stale quickly if you play them too much, too often, simply because the experience doesn’t change drastically. It’s like watching a movie too much; it might last for a bit, but even the greatest movies require a break between viewings. Having unique powers can change up a game enough to force you to rethink strategies and approach a game from a new perspective just by granting you different inherent abilities from the start, which can make frequent playings interesting enough to last much longer before the game loses its luster. Beyond the inherent differences in unique powers, asymmetry also affords more strategic options; in one game, go all out in the direction your power suggests; in another, mix your strategy to balance the same power’s leanings with work in other direction. Cool! Asymmetry is FUN: I can’t tell you how many games with asymmetrical powers I’ve played where someone makes a move that is awesome, and I go “what, how can you do that?” and they show me their player card, and I go “that is AWESOME!” It’s about as much fun for me to watch other people figure out how to do ridiculously cool things with their powers as it is to do my own cool things. Unique powers gives each player something that makes them feel powerful, like they have an advantage over everyone else – but EVERYONE has some advantage the others don’t, so everyone gets to feel cool. Feeling powerful or cool or smart is what leads to long term enjoyable experiences and memorable moments that will be re-lived again and again. Pretty much all of my favorite games – Cosmic Encounter, Rex, X-Wing/Attack Wing, Twilight Imperium, Netrunner – have cool, unique powers that players get each game, and there’s a reason for that. Yes, asymmetrical powers need to be balanced and tested so one power doesn’t have a significant advantage over the others, but when implemented well, asymmetricality just makes board games better. I’m sure many people are afraid that unique powers makes a game harder to teach or will make balanced gameplay harder to design, but the truth is, well-written rules can make asymmetrical powers fit in the flow of the game well, and balanced gameplay is difficult regardless of the inclusion of asymmetry. 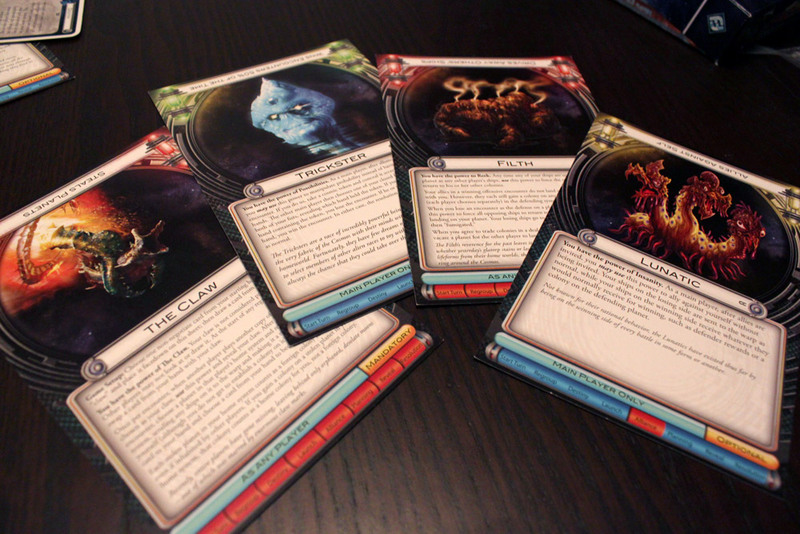 Sure, there are a few games that don’t need asymmetry – small card games, and the like. But any strategy game that is worth its weight should include unique player powers. I play games to escape, to some degree. I play games over lunch to forget my work and for the next hour inhabit another role, whether that be a medieval monarch or a trader or the overseer of some building or expansion task. Despite claims of “everybody’s special” and “you can be whatever you want to be,” we all know that the real world favors some people over others, some traits over others. (Money seems to do a lot more than talk these days, for example.) The real world is full enough of imbalance–why would I want to continue in that vein at the gaming table? Asymmetrical powers ruin games, and let me tell you why, why, why. Asymmetry disturbs balance. Balance in a game is important. It ensures that the game is truly a game and not just an exercise or an experience. The game is the field on which two opponents will meet for decisive battle. But playing fields should be balanced. While it’s possible in some degree to balance asymmetrical powers, it seems far more often the case that these powers make the game lopsided from the start. Especially when these powers are randomly assigned, they make the game state imbalanced from the start, making it far easier for the game to run off course. Unbalanced is unfair. We’ve all played with (or, let’s be honest, been) game analyzers involved in post-game commentary. “If I had done this, you would have done that, and then I would have won!” As bad as that is, it’s even worse when a player can point to some unearned advantage that clearly worked in the other player’s favor. Whether this advantage was the deciding factor is unimportant. What matters is that it’s there, and the other player can attribute your victory to that rather than the skill it took to get you there. I’d rather win on my own steam and lose on my own steam than have my success explained away by asymmetry. There are better ways to achieve direction, replayability, and fun. I agree that asymmetry can achieve replayability and direction (jury’s out on “fun,” especially in some games). However, aren’t there better ways to achieve this? For example, direction can arise from a game state that is open to all players. In Power Grid, players auction power plants from a current market, but they see a futures market to determine whether a plant is worth the investment. It’s true that each power plant will have only one owner, but players determine for themselves whether it’s worth it to acquire what they need. Trash may be more expensive, but there’s no one else trying to power their cities using trash, so that might be a viable direction. Or maybe coal is cheap, and you’ve got the fewest cities, so it’s worth it to buy another coal power plant. Seeing these power plants gives direction to the players’ decisions without assigning them advantages willy-nilly. Similarly, Dominion is one of the most replayable games on the market, yet its replayability comes in variety, not asymmetrical powers. In fact, if there’s one thing that can be said in Dominion’s favor, it is that the playing field is always balanced. Players have equal access to all of the cards available. The paths they choose might not lead to the same ends, but that’s the game: finding the most efficient path to victory. And it’s entirely possible to have fun in a game–uproarious fun–without imbalance. Consider Medici, a game I reviewed just yesterday. This may be hard for Futurewolfie to believe, but this Reiner Knizia game provides one of the most boisterous play experiences you’re likely to have. Once again, all players have equal access to information, equal access to resources, yet the game provides fun in the tough decisions and the thrill of pressing your luck (which, again, is an informed decision). It’s no secret around these parts that I don’t like Cosmic Encounter very much, and the main reason for this is its asymmetry. At the start of the game, through no skill on the players’ parts, they are assigned the power they will be stuck with till the end of the game. It’s awesome if you’re the Zombie. It’s awful if (like me) you choose Fido as the better of the options you’ve been dealt. There’s talk of alliances balancing the game, but that’s hogwash. No one wants to side with the loser in a clear rout, and the game has definite (and often obvious) winners and losers. I contend that games are better when they put players on equal footing from the get-go. Then what takes center stage isn’t a player’s happenstance. Rather, player skill is what a game is evaluated on. I’d much rather forge my own destiny in a game (win or lose) than have it assigned to me by factors beyond my control. While there are varying degrees of asymmetry, and I can tolerate some points on the spectrum better than others, achieving true balance in asymmetry is a difficult task for designers, and most don’t succeed at it. I don’t think that luck must be absent from games; in fact, I almost think it necessary. But I’d much rather limit the luck by doing away with asymmetrical powers than the other luck present in a game.